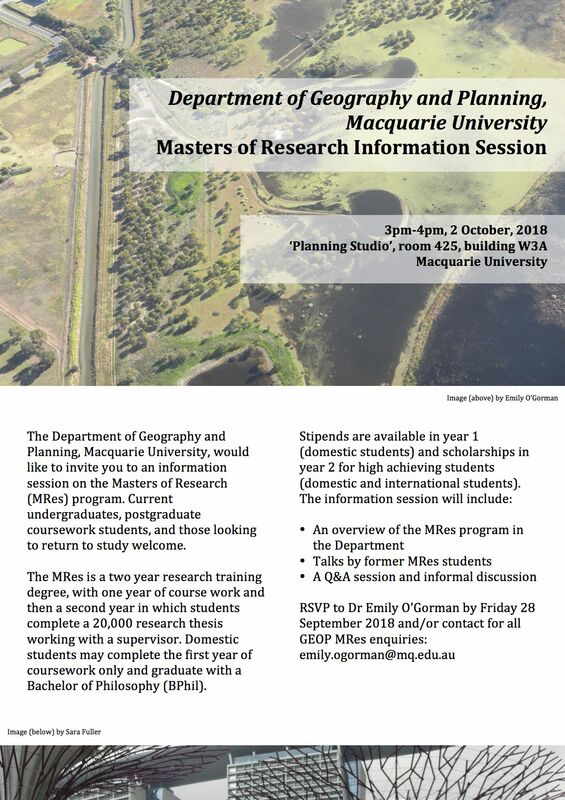 The Department of Geography and Planning at Macquarie would like to invite you to an information session on the Masters of Research (MRes) Program. Current undergraduates, postgraduate course work students, and those looking to return to study are welcome to attend. When: 3pm-4pm 2 October 2018. Where: 'Planning Studio' room 425, 6 First Walk (building W3A), Macquarie University. The MRes is a 2 year research training degree, with one year of course work and then a second year in which students complete a 20,000 word research thesis working with a supervisor. Domestic students may complete the first year of coursework only and graduate with a Bachelor of Philosophy (BPhil). RSVP to Dr Emily O'Gorman by Friday 28 September 2018 and/or contact for all Geoplan MRes enquiries: emily.ogorman at mq.edu.au.